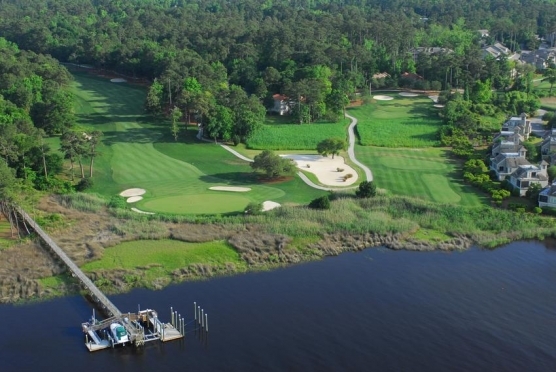 LONGS, SC – The Myrtle Beach Area is fortunate to have two Jack Nicklaus Signature courses – Pawleys Plantation on the South Strand and the formidable Long Bay Club on the North end. The latter has a well-deserved reputation as one of the most challenging and difficult golf courses in the area. It was cool and sunny, but not uncomfortable the day we played The Long Bay Club. The greens, which are well known for their undulation, were in great shape. Although a Bermuda grass they were like putting on bentgrass. The fairways and tee boxes were also in ideal condition. I’ve played a dozen rounds on this course and have always found the conditioning to be outstanding. Arrive early to roll a few putts and take advantage of the sterling practice area. Props are definitely due the course maintenance crew. In fact kudos are due the entire staff from the bag drop through the pro shop to the grill. These folks epitomize southern hospitality and are genuinely glad you’ve chosen their golf course. As mentioned I’m no stranger to The Long Bay Club. Although the course takes a toll on my confidence, I keep coming back. This golf course is one of my favorites and I will get the better of it, someday. Great waste areas and man made mounds certainly provide the character for this special venue. However, it’s the length, slope and course rating that make it clear this is going to be a challenge. Pay close attention to the Tee it Forward guidelines that are available in the Pro Shop. This PGA/USGA program suggests selecting tees based on your driving distance. If you’re not 225+ yards with your driver, play from the Gold Tees for maximum enjoyment. The Championship Black Tees are 7025-yards and rated 74.6/141. The Blue Tees are a demanding 6593-yards at 72.3/136. The White Tees are a difficult 6209-yards at 70.5/133. Gold Tees are an unusually long 5715-yards 68.7/125 for men and 73.5/130 for the ladies. Even the Red Tees show length at 4944-yards and a strong showing of 69.5/111. Play to your driver’s distance for maximum fun and pace of play. The Par 3s are quite handsome, but misleading. Hole 5 is an island green that teases you with an attractive, easy look. Choose your club wisely. I’ve seen more than one ball roll off the back of the green and into the pond. Hole 17 can be pure eye candy during certain times of the year. Gorgeous lilies cover the pond that carries from the tee box to the green. Again, make the correct club selection and avoid the sand hazards that protect the green on the left. You’ll definitely need to bring your “A-game” to the Par 4s. If you’re not driving the ball well, you best have your scrambling shoes on. Only Holes 9 and 10 (the signature hole) are under 365-yards. Either water, or large sand waste areas protect them both. For the golf purist it’s Hole 4 the No. 1 Handicap, Par 4. Weighing in at a hefty 417-yards this one provides an outstanding golf challenge. Waste bunkers down both sides and a fairly narrow landing area make the drive and even a lay-up a real test. Any shot into the green has to consider the length and slope of the green. Pay close attention to your yardage. An errant shot away from the pin can easily lead to a three putt. Hole 18 is a great finishing hole with a risk/reward opportunity off the tee box. Take as much as of the pond that you dare, or travel a safe route if you’re protecting a score. You’re going to like the Par 5s at The Long Bay Club. Each is distinct and offers a different set of challenges. Hole 2 is just long and requires three solid shots to reach the green. Hole 5 requires shot making and length and certainly deserved its mention in The Sun News book, “The 100 Greatest Holes Along the Grand Strand.” On Hole 11 you’d be wise to avoid those little pot bunkers to the left of the fairway. A Sunday pin position on the left front makes it almost impossible to go for the flag. Hole 16 has a berm that comes into play off the tee. That pesky berm continues up the right side and makes for a very narrow landing area. As implied earlier, the Long Bay Club has been a nemesis of mine for years. None-the-less this great golf course has been a favorite since day 1. You really should take a look at what Jack has wrought.